Year 6 are in charge of the Christmas Shoe Box Appeal. This is the report from our local parish magazine. 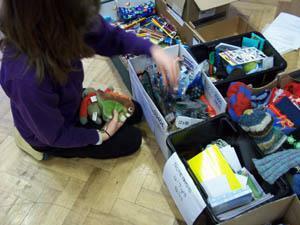 "Awesome" "Epic" "Overwhelming" "Amazing" "Dramatic" "Inspirational"
That was how the pupils of Bishopthorpe Junior School described the culmination of nearly two months efforts - the day the shoe boxes were packed and stacked ready for collection! "We collected; we counted; we sorted; we wrapped; we packed; we loaded; we waved them off"
The school Harvest Festival, held on October 18 in St Andrew's Church focused on Shoeboxes, and every child brough one thing for a box with the result that 3 more large storage boxes were filled. On the following Sunday some representatives from the school were at the Church again to lead the Family Serviced which they based on the concept of the uncondtional gift. It was a joy to be at these Services. When the final count came there was a loud cheer, a wonderful 263, and by the next day when the boxes were collected by the local representative of Children in Distress there were 265. As they waved the van off, some of the children said they would quite like to have gone with them! They had enjoyed working with the adults, they had enjoyed the whole buisness of getting the boxes ready for sending to Romania in time for Christmas, and they had especially enjoyed knowing that they were sending presents that bring love - 'love in a box' - and hope to those in great need and often in serious distress. Thanks to Sally Sutton for overseeing the work at the school, to Alison Jones for encouraging the community, to all who helped in any way whatsoever, and to all those who donated items and money. Can we beat 265 next year? With your help we can! !